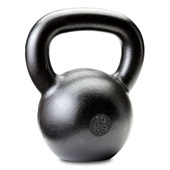 How sure are we that Russian Kettlebell - 10kg (22 lbs.) will work for you? 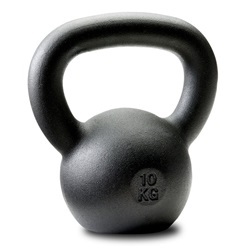 Simply fill out the form below and put Russian Kettlebell - 10kg (22 lbs.) to work for you right now. 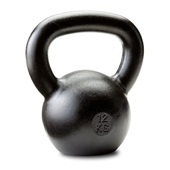 Obviously, we would go out of business if Russian Kettlebell - 10kg (22 lbs.) didn't work, the way we said, right? 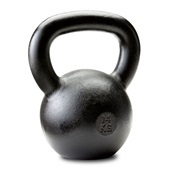 With the promise of a full refund if you're unsatisfied, you have nothing to lose by trying Russian Kettlebell - 10kg (22 lbs.). Go ahead and try it today. Quickly Transform their Physical Shape…"
Dragon Door has designed a 22 lb RKC Kettlebell which is uniquely suited to women's exercise needs. While most women will begin with Dragon Door's specially designed 18lb kettlebell, our 22 lbs kettlebell gives you faster, more powerful results by more dramatically challenging your body to burn extra fat and build denser muscle. Rated 10/10 Hardstyle To The Bone!! The best quality kettlebells out on the market. Also, I already own a pair of 12kg(22lb)kettlebells. I will be enjoying the pain more once I add a pair of 14kg(31lb)and 16kg(36lb)kettlebells to my collection before the year ends!!! I have several DD bells. Each time I order one, I wonder if the quality will be different. However, each time, the bell is true to DD's well earned reputation for quality. I wanted one light bell for light fill-in work. This is an excellent weight for slow concentration curls, no-load technique work, etc. My girlfriend uses it for swings. The bell is perfectly coated, and flawless. Thank you DD for yet another great product. I am very picky about where I shop, and I never make impulse acquisitions. I research everything. Time after time, I return to DD for bells and books. Buy quality. As Thomas Jefferson said: Never buy what you don't want just because it is cheap. Thanks again for another quality product. The 12k can be too much for some of our more athletic beginners. The 18# is too small. This is perfect. Rated 10/10 Same great quality from Dragon Door! 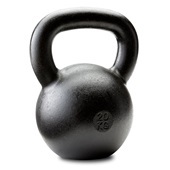 I ordered a pair of the 10kg's for my wife and once again found them to be of the same consistent and high quality of the other 7 RKC Dragon Door kettlebells purchased in the past. With each kettlebell purchase I have been tempted to buy a less expensive brand, but once again I am glad I went with the best! 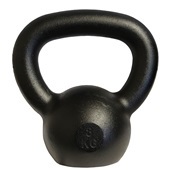 Rated 10/10 RKC Kettlebells - Simply The BEST! As a Dragon Door Affiliate for 10 years, I have expereince with various size kettlebells, and can say with absolute certainty that the Dragon Door kettelbells are the most consistently manufactured, most solid, mot durable, most functional bells on the market! They are solid 1-piece cast iron...it just doesn't get better than that. They're likely the most durable products ever made, and the handles are designed to provide maximum comfort and range of motion. Obviously, I give the Dragon Door kettlebells the highest possible rating, as anyone would, once they use them! Rated 10/10 DRAGON DOOR ROCKS! ( pairs of 4, 6, 8, and 12 kg ). They are a wonderful addition. I had some confusion on the email sent about my order and emailed an inquiry to Dragon Door. I received a prompt phone reply, a courteous explanation, and my bells arrived 2 days later right on schedule. Great service! Although I've been very satisfied with every DD kb in my set I've bought over the years, the textures on them have slightly wavered over the years. Some have smooth thick coatings, others varying degrees of matt. My only complaint is that they don't match each other, but they're still outstanding. This little guy adding to my set really shows DD perfected the process. I hope they keep this rendition. It's just the right amount of matt finish to hold chalk well but not so much you need to "season" the handle or risk grinding your callouses. You can do a gazillion snatches with this texture and your hands will be happy. The size works well for Windmills and my ladies in my classes who just love it for presses and snatches but not quite ready for volume with the 12 yet. Look no further and buy without any hesitation from DD. 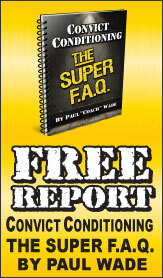 They are the BEST when it comes to quality kettlebells. I have a pair of 18# kettlebells, a 26# kettlebell. I gave away a 9# Ader, and a pair of 13# Ader kettlebells. The 9# is way too light, the 13# ones were not 2 years old, and already the pink paint (Kettlebells for the Cure promotion), on those was wearing off. I needed a kettlebell lighter than the 26#, but heavier than the 18#. I wasnt happy with the Ader, so I decided to spend some more $$ and buy the 22# dragondoor. I was VERY pleased, with the prompt service, the Enjoy the Pain logo on the shipping box. The quality of THIS kettlebell is 1st rate, it has the right heft, the handle is smooth, easy to grasp, and this will be a good weight for me to do swings with. I will buy Dragondoor kettlebells from now on. Thank you for a quality product!! The kettlebell is terrific. I also have the 36 lb bell but this is a good size as a supplement for someone wanting to start. As Pavel states, form is everything, so use a lighter bell to start - don't rush into a heavier one until comfortable.